Some of my viridiflorus second-generation progeny might have future value as additions to Division 7 cultivars. Here’s a collection of five jonquil seedlings from the Livermore Show on March 7-8. My opinion is that this was my best five-stem collection. I’d like a bulb of each! Did this group win, Bob. I like it–the variety as well as the charm. Nice display Bob. Great color and multiple heads. Looks like good form on these ones Bob with good petal overlap. 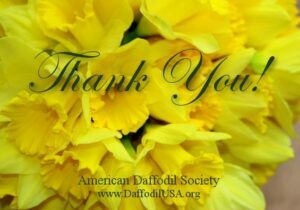 The Judges, in their wisdom, preferred the Yellow Daffodil Collection for the Purple Ribbon.